If your dog has cataracts, you might observe symptoms such as squinting and evidence of vision loss. Cataracts, common lens irregularities caused by opacities, keep light from reaching retinas. When dogs have cataracts, they suffer from blurry vision. Some cataracts can lead to full blindness. When dogs have cataracts, their eye lenses become darker or murkier, with cloudiness that interferes with lenses that should be transparent. These cloudy spots can be small, but in some cases they can take up most or all of the eye. Many different things can potentially cause cataracts in dogs. The bulk of cataract cases in dogs, however, are inherited. Eye injuries, eye inflammation, toxicity, infection, dietary deficiencies, aging and disease are some causes of the condition. Internal diseases that involve the eyes sometimes trigger cataracts in canines. One internal disease sometimes associated with cataracts is diabetes mellitus. Progressive retinal atrophy is another example of a disease that can lead to cataracts in dogs. Cataracts can occur in all canines regardless of age or breed. Some dog breeds are particularly vulnerable to inherited cataracts, however. When dogs have hereditary cataracts, signs of the condition typically appear when they're less than 2 years old. Juvenile cataracts are prevalent in breeds such as Siberian huskies, Cocker spaniels, dachshunds, Boston terriers, Alaskan malamutes, schnauzers, Old English sheepdogs, English toy spaniels, Pekingese, West Highland white terriers, vizslas and Great Danes. They're also prevalent in poodles in general. Some breeds even have genetic tests that can evaluate dogs for indications of juvenile cataracts. 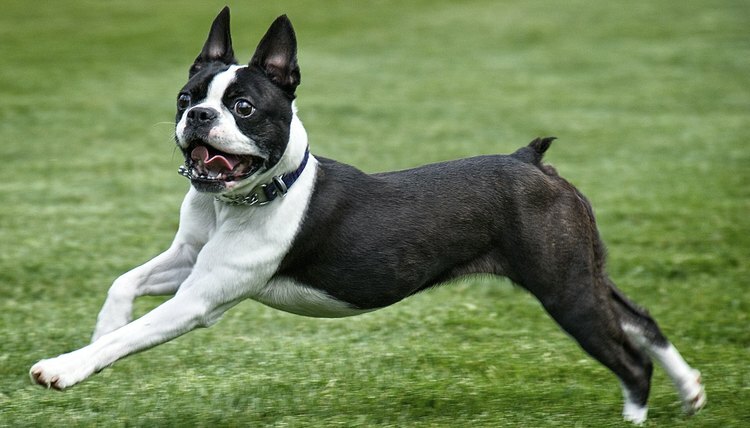 Boston terriers, for example, can undergo testing for the condition. You may be able to tell whether your dog has cataracts simply by paying attention to his appearance and behaviors. If your pet's eye color is different than it was before and has taken on a white, gray or bluish tone, he might have cataracts. If you notice inflammation inside his eyes or around them, then cataracts could be the cause, as well. Dogs with cataracts also have the tendency to squint when they're viewing things. If it seems like your dog is suffering from vision troubles, cataracts could be the reason. When dogs appear hesitant to check out unfamiliar areas, vision loss is often the cause. If your dog is experiencing vision loss from cataracts, you might see him running into furnishings and fixtures in your residence. If you've picked up on any possible signs of cataracts in your pet, contact your veterinarian to make an appointment immediately. Veterinarians typically diagnose dogs with cataracts after conducting physical exams and various forms of diagnostic testing. Examples of these diagnostic tests are eye pressure assessments, complete blood counts, eye lens internal evaluations, ophthalmic ultrasounds and electroretinography. Veterinarians frequently check dogs for cataracts by conducting Schirmer's tear test. This test analyzes the eyes and their capacity for tear manufacturing. Veterinarians also assess cataract existence by observing how dogs walk and how their eyes focus. Vets frequently look for the presence of foreign matter within the eyes. If you take your pet to the veterinarian for cataracts evaluation, she might refer you to a veterinary ophthalmologist. Veterinary ophthalmologists specialize in eye matters such as cataracts and glaucoma. General practice vets do not always treat these types of highly specific eye conditions.